Ron won a 7-night trip on any Solomon Islands liveboard trip with Bilikiki Cruises! The story: While in Kona, I went out on a Black Water Dive with Kona Honu Divers where we were attached to a 40' vertical line in over a thousand feet of water at 10PM. While suspended in the black water you observe life forms that you have never seen before or even imagined that surface in the shallows. Every dive is an adventure and full of life. 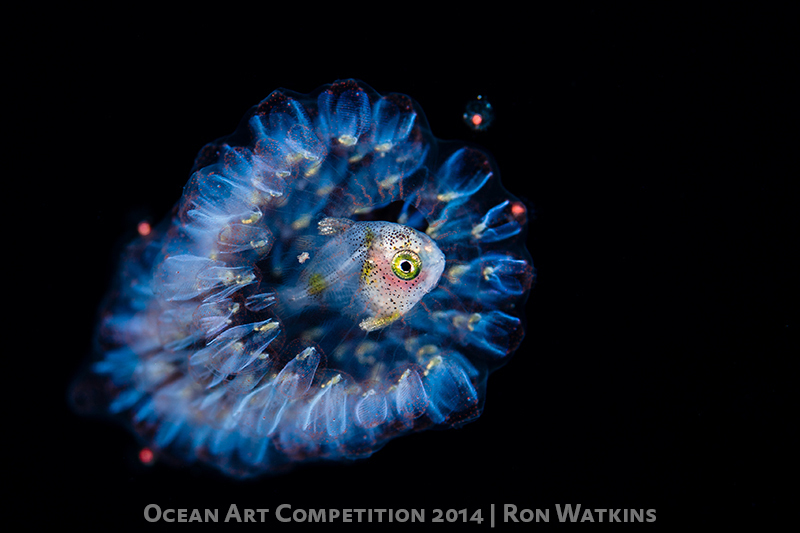 This juvenile carangids seeks the refuge of a tiny pyrosome as a temporary commensalism for protection against predators in the dark. After viewing the image on the computer, I also noticed that the fish had a few room mates in the pyrosome. Camera: Nikon D800, Nikon 105mm lens, Sea & Sea housing, dual Sea & Sea YS-D1 strobes, Light & Motion Sola 800 focus light.